William, the sixth Duke of Pelham, enjoys his punctual. securely structured life. Orderly and predictable-that's the way he likes it. But he's in the public eye, and the scandal sheets will make up anything to sell papers. When the gossips link him to Juliette, one of the most beautiful and celebrated courtesans in London, chaos doesn't begin to describe what happens next. Juliette is nicknamed the Duchess of Dalliance, and has the cream of the nobility at her beck and call. It's seriously disruptive to have the duke who's the biggest catch on the Marriage Mart scaring her other suitors away. Then she discovers William's darkest secret and decides what he needs in his life is the kind of excitement only she can provide. 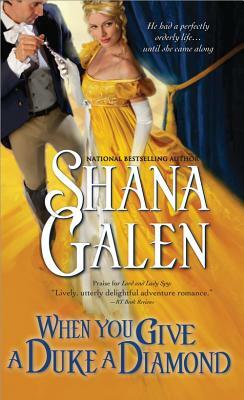 The first in a sparkling Regency romance trilogy from acclaimed author Shana Galen following a glittering trio of celebrated courtesans whose fortunes depend on the ton believing the rumors about their mysterious lives.